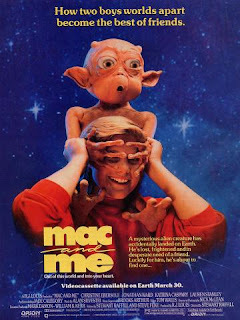 On this week's episode, the guys finally get around to trashing the feature-length McDonald's commercial, Mac and Me! How is it these alien puppets' mouths were shaped so it was impossible for them to eat McDonald's products? Why didn't that mother tell those kids about the cliff? And you can NOT just jump to a citizenship scene like that! PLUS: Lots of talk about UFOs and aliens "coring out" livestock! Mac and Me stars Christine Ebersole, Jonathan Ward, Tina Caspary, Jade Calegory, and Ronald McDonald as 'Himself;' directed by Stewart Raffill.